I had shared my sentiments regarding the first Rurouni Kenshin Movie which showed in the Philippines about two years ago so I think it’s only fair to share my thoughts about it’s installment. The first movie came off as a disappointment for me because of the things I heard before I actually seen the movie. This time around, I decided to not read anything about it before watching it. That mean I saw the movie as it was done by everyone who worked hard to make it without additional expectations from hearing how good it actually is. Contrary to the first movie, I didn’t have any expectation about it because I wanted to see it simply because I want to. Not because I want to see if it was really as good as other people said it was. 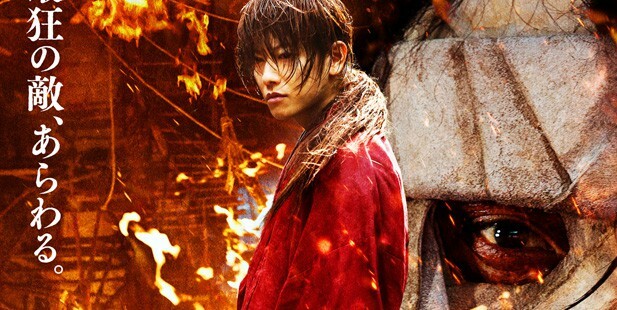 Rurouni Kenshin: Kyoto inferno was a lot better than the first one in a whole lot of ways. One was because, it went deeper to the story of Kenshin Himura the man slayer turned wanderer and how his moment of peace was disrupted by another man slayer from the previous era. My knowledge of the story was limited to the anime I’ve seen ages ago. The good thing about this movies was that, it refreshed me the scenes from the series which I’ve actually forgotten. As always, the characters were all portrayed well most especially Himura’s character played by Takeru Satoh. That calm and relax face when he’s the wanderer and the way his eyes turned to a cold blooded Samurai portrayed by Satoh was as good as Kenshin from the animer which is saying a lot. Another character played well was Sanosuke Sagara. That cocky attitude and loud guy came to life Munetaka Aoki. My only complain was that, I can’t stand how he always looks so dirty in the movie. I felt like asking him to take a bath and wash his clothes every time his character appeared. The fight scenes were simply amazing. That was another great part of the movie. Seeing the fight happening. Though I think that the real ones are still about to be seen on the final installment of the movie. The best part for me was the scene of this kid who’s about to take revenge on the people who killed his family but then Kenshin came and stopped the kid. From the time the kid saw his parents hanging lifeless, when he shouted in agony but couldn’t really cry to that point where Kenshin hold his hands and told him that ‘the dead only wished that the living be happy’ and the kid finally shed his tears… that was the most heartbreaking scene of the movie for me and most touching too. Because it told a lot of the story that is still about to unfold and the story how Kenshin came to me Battosai then became a wanderer. Misao and Sojiro’s character was another great addition to the movie. I think it was their characters that brought life to Kyoto Inferno aside from the presence of Shishio. And yes, there’s still Aoshi’s character that we all have to look forward to on the next movie. And finally, as the movie is about to end, I love everything about it except Kaoru’s part. Yes, I know it’s all part of every Samurai X story, but somehow her character always have a way of ruining the good parts for me. From the anime to the movie, one thing never changed, Kaoru will always be the damsel in distress that Kenshin Himura needs to rescue. And I guess, we all have to look forward to how this rescuing will actually end for Kenshin… and Kaoru and well, for the rest of the Rurouni Kenshin cast. 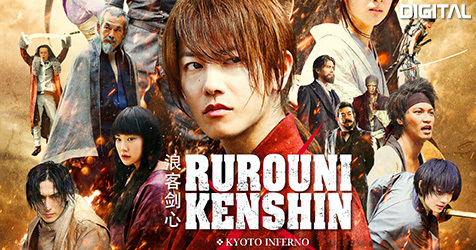 One thing I can say though is, KUDOS to everyone who made up the Rurouni Kenshin: Kyoto Inferno Movie. May you be a man behind or in front of the camera, each of you did a great job on this great movie. See you all on the next one…..
movie of rurouni kenshin were all of my emotions were stirred. I was expecting something like that or something half as good as that but no… The story didn’t even come close to showing kenshin-sama’s fun and happy nature.